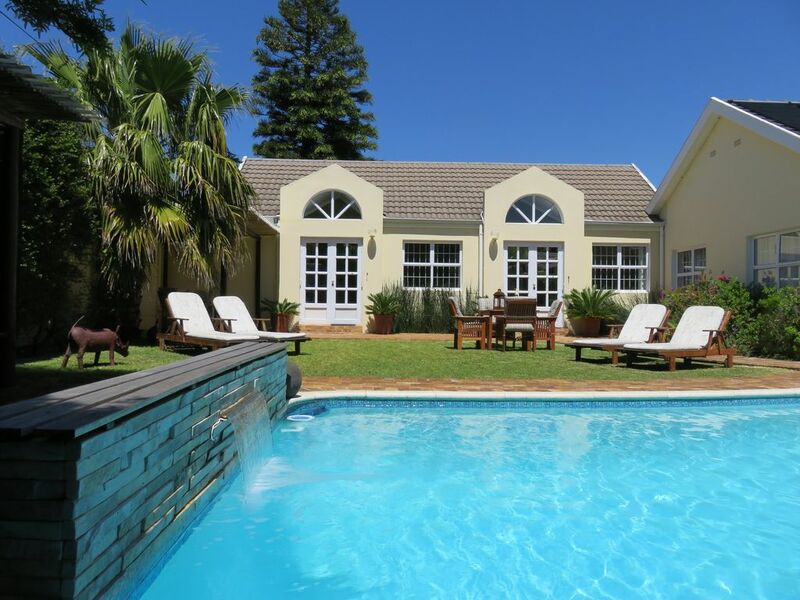 They offer a lovely decorated open plan apartment only 20-30 minutes drive from Cape Town's city center. Our beautifully decorated studio unit is facing the garden and the large solar heated pool. It has a king-sized bed with high quality mattresses and lovely chosen bed linen. A large Ikea PS sofa bed (1.60 x 2.00 m) in the same room is easily transformed into a perfect bed for two children. The modern spacious bathroom has a shower and soft towels are supplied. The kitchen has a microwave, hot plates, electric kettle, toaster, coffee maker and refrigerator with freezer and everything you need for 4 people. In the apartment there is a TV, safe and extra Euro plugs. Internet reception for your notebook is available to rent. You can relax on the sun loungers in the garden or on the covered pool deck with its romantic fairy lights next to the barbecue. What to do nearby:: Go swimming in the warm waters of Fish Hoek beach, diving and snorkelling in False Bay and with the penguins at Boulders. Surfing is popular at Kommetjie. Ride horses in Noordhoek, Camels at Imhoffs Farm or go for a walk in the surrounding Silvermine Nature Reserve. Explore caves in our mountains or do rock-climbing. Do the 'baboon walk' with the baboon monitors. Have a sun downer on the famous Chapmans Peak Drive or visit the nice restaurants in trendy Kalk Bay harbour, in historical Simonstown on the water’s edge or in the Longbeach-Mall in walking distance from 2 Oceans Apartments. The Longbeach Mall in Sun Valley offers plenty of Shops, Supermarkets, Internet Cafe & Cinemas. Watch the whales in season or the birds all year long. Play Golf in Clovelly Country Club, Westlake, Steenberg and Royal Cape or do the Art Route in Noordhoek & Kommetjie. More activities in our area:: A 20 Minute scenic drive over Chapman's Peak Drive leads you to Hout Bay with its Seal Island, further to the famous Camps Bay beach, to Cape Town’s Waterfront and in the City Centre with world famous Table Mountain. The Constantia Wine Estates are just over the mountain and invite you to taste the great South African wines and Kirstenbosch Gardens show you beautiful Proteas while you listen to the Sunday Concerts in summer. Another scenic route to the south leads you to the wild beaches of Scarborough, via an Ostrich Farm to the famous tip of the African continent the Cape of Good Hope in Cape Point N.P. Beautiful day trips:: A drive along the beautiful False Bay coast brings you into the wine region with over 300 wineries. Do wine tasting and brandy tasting in Stellenbosch and Paarl, enjoy the French cuisine in Franschhoek, discover historic Tulbagh, try olives and other delicacies in Riebeek Kasteel, bathe in hot springs in Montagu and discover the Route 62, watch the whales up close in Hermanus, book a safari in the private game reserve of Aquila, eat crayfish on the west coast in Paternoster or splash around in the rock pools of Bain's Kloof. The beautifully decorated bathroom has a shower, toilet and wash basin and is equipped with soft towels. A spacious cabinet under the basin provides plenty of storage space. Modern one lever mixers, a large mirror, good lighting and an electric socket in the bathroom offer the comfort you are used to at home. In the low season from May to September, we offer very affordable rates for long term rentals of 1 up to 5 months. The apartment is very safe and has its own entrance and a secure car park on the property. Laundry can be done by us, golf caddies are available to rent. Affordable airport transfers, trips and affordable rental cars can be booked through us. Lovely large studio apartment with large and comfortable KS bed, settee and chair and tables, WiFi and small pool in quiet and secluded garden with mature trees and plants. Very safe. Minutes from a shopping mall, the fabulous secluded beach at Nordhoek, as well as the Farm village and restaurants with live music, and from the Ou Kaapse Weg nature reserve and pass to Constantia vineyards and Kirstenbosch as well as the amazing Chapman's Peak coastal drive to Hout Bay. 10 minbutes from bohemian Kalk Bay and tthe drive to Cape Point nature reserve. All parts of the Cape are so easily and quickly reachable from Sun Valley. Very friendly and helpful hosts- with possibility to doing a wash and iron for a small fee. As there are 2 studios side by side, perfect to share with friend or family but each with privacy and own bathroom and mini kitchen. Great place, great location, great hosts. We REALLY enjoyed staying at the 2OceansApartments. The apartments were clean and perfect size for us. It is in a great location! The hosts, Anja and Thomas Ostermann were wonderful! Anything we needed they were quick to help out. They even took the time to show us on the map where some of the common tourist attractions are located. We would stay there again and would highly recommend them to anyone! We were very disappointed with our stay. Partly this was our fault for mis-understanding the advert. This is a studio room, as it says at one point on the ad, NOT a one bedroom, as it says at another point on the ad. (The picture of the exterior, which looks fab, is actually of 2 units not 1.) If you're a couple, wanting an inexpensive base and you don't want to do anything other than very basic cooking, don't want to do laundry and don't need the internet, then go ahead. On the positive side, the pool is lovely. However, it is totally unsuitable for a couple with a small child, as we are. To expect the little one to sleep on a turned-to-face-the-wall sofa is crazy, and even when we got the cot our little girl had a lot of trouble staying asleep if we wanted to cook or do anything. It's fine in most respects, but very, very basic. No TV channels to speak of. No soap provided, even for washing hands. The internet is wired, not wi-fi, and you're restricted to how much internet you can use because their usage is capped. Anja will do washing for you if you pay extra, and does a good job, but that and the internet mounts up. We just never felt comfortable there. The list of do’s and don’ts you get when you hand over the cash is a bit like school, and maybe ok for students but wasn’t for us (We were never going to have loud parties, but we might have wanted to invite a guest back!). Our little girl got a little (washable) crayon on a sheet and a lounger cover and Anja wrote us a post-it note about it rather than have a quiet word. Little things like that give you a bad feeling. They use solar heating for hot water with no electric back-up which meant the water in the morning was never hot enough for a good shave. The bed, which is advertised as big, IS wide (it’s two singles pushed together) but you then have the crack down the middle plus it’s got a tailboard, and if you’re over 6 feet tall it’s simply too small for a good night’s sleep. I’m sorry to be negative, but you can see from our glowing reviews elsewhere that we don’t carp for the sake of it. It just didn’t work for us. The accommodation and hosts were absolutely wonderful. The apartments are furnished and finished to a high standard and suitable for all self catering. Situation is in a quiet area and near a shopping mall with supermarket and restaurants,which is ideal. I highly recommend this for a very reasonable stay whilst in Cape Town. You will definitely want to return. This has been everything we wanted - excellent location, good quality accommodation, great for self-catering (or just making sandwiches for the next day on the road!) and a great price!!! Silvermine and other attractions close by! Not sure what this says in German? but we loved our return stay here and highly recommend it. Don't know what the above says!!? Go swimming at Fish Hoek beach, diving or snorkeling in the False Bay or with the penguins at Boulders Beach. The spot for surfers is Kommetjie. Horses can be ridden in Noordhoek or you can go hiking in the surrounding Silvermine National Park. Discover the caves in our surrounding mountains or make the 'Baboon Walk' with baboons. Take a 'sundowner' at Noordhoek beach and visit the trendy restaurants in the harbour of Kalk Bay, historic Simonstown or in the nearby Long Beach Mall shopping center in Sun Valley with many shops, supermarkets, Internet cafes and cinemas. From September through to November you can watch the whales from the coastshore. Play golf at nearby Clovelly Country Club. A short ride on the Chapman's Peak Drive takes you to Hout Bay with its Robben Island, to Camps Bay Beach, to Cape Town's bustling Waterfront and famous Table Mountain. The tip of Africa, the Cape of Good Hope and an ostrich farm is just a short drive to the south along some stunning beaches. Clovelly Golf & Country Club, Westlake, Steenberg. Royal Cape, Rondebosch, Mowbray, King David, Metropolitan, Milnerton, Atlantic Beach. We hire out golf caddies and help to book your tee off times. Die Kaution von R 500 wird bei Aufenthalt mit Kleinkindern erhoben. Günstiger Flughafentransfer & Tagesausflüge. Mietwagen bereits ab 19 € pro Tag.